The Label Printer – Applicator is designed for use with any XL200 Series Controller system. It is the ideal solution for parts requiring complex labeling or high quality labeling such as bar coding. 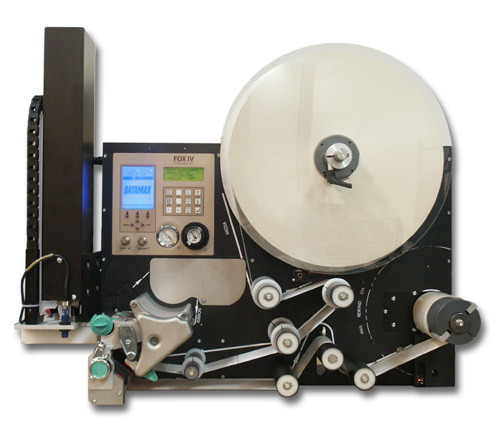 The Label Printer – Applicator eliminates the need to change out a pre-printed spool of labels with each change of part length or material. Since the XL200 Series Controller already knows all the information about the part being produced, it can tell the Label Printer – Applicator exactly what to print on each individual label. High line speeds are not a problem with the Label Printer – Applicator. It has a high speed thermal transfer print head capable of printing up to 60 eight inch labels per minute. This allows for line speeds of up to 480 feet per minute when producing an eight foot part, for example. With the Label Printer – Applicator’s universal mounting bracket and unique label application method, labels can be applied right side up, upside down, or at any angle in between. The standard unit prints labels ranging from 0.75″ X 0.5″ to 4.65″ X 11″. Labels created by the Label Printer – Applicator are commonly utilized both internally and externally to the plant. An example of an internal use is a manufacturer who performs secondary operations on roll formed or cut-to-length sheets or uses them as parts in a larger manufacturing process. A unique identifier can be bar coded onto the part as it is being produced. This bar code can be scanned later to identify that part. The Label Printer – Applicator is regularly used by manufacturers of items such as metal studs which are sold through retail outlets. The labels applied to these parts can be designed to meet the exact specifications demanded by the retailer. Label formats come from one of two sources. The XL200 Series Controller with the Part Printer option has a default format, which includes fields for Length and Pattern number. This format is not changeable by the user. Users of Eclipse Production Management Software have the option of creating their own custom label format by choosing from a list of over 35 variable fields as well as fixed text. Any field can be printed as a bar code. Custom label design is also available through AMS Controls.